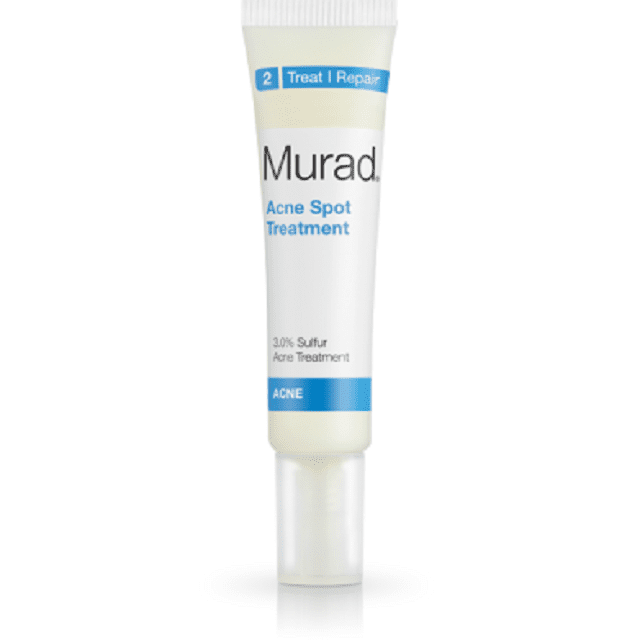 Murad Acne Spot Treatment is an over-the-counter spot treatment for mild to moderate blemishes. You apply it to individual pimples to help reduce redness and swelling, and to help speed up the healing process. You can buy this spot treatment alone, and it can also be found in the Murad Acne and Aging Skin Solutions skin care kit. $18 for 0.5 fl oz. Available at Sephora, and at some day spas and salons. It can also be purchased direct from Murad and from other online retailers. It's very gentle compared to most acne spot treatments. I've got a draw full of spot treatments that have disappointed me. It's not that I'm rooting for them to fail. I just haven't found one that made any type of change in my pimples (besides making them dry and flaky). To be honest, I didn't really have high hopes for the Murad Acne Spot Treatment. So, I was pleasantly surprised to find that I actually liked this product. I immediately liked the feel of this product: lightly creamy but aqueous (and not at all oily). Just a tiny dab will yield enough treatment for multiple breakouts. This stuff spreads like crazy, which is good since the tube itself isn't inexpensive. But it definitely will last a while. I'm not sure why, but this spot treatment smelled a bit like coconut to me. I happen to like the scent, but you may not if you're not big into tropical fruit. Not to worry, though. The scent is super light and dissipates as soon as the product is dry. You probably won't be using so much of it that the scent would be a problem anyway. Like I said before, I've never really noticed a difference in my blemishes when I use a spot treatment. But this one did seem to knock down some of the redness and swelling, especially if I applied it as soon as I saw a zit developing. I'm not really certain it made the pimples heal any faster, but at least it kept them relatively in check until they did heal. This product uses sulfur instead of the benzoyl peroxide that is common in many spot treatments. So if you are sensitive to benzoyl peroxide, you should be able to use this treatment with no problems. Compared to many other spot treatments, this one is also fairly gentle. I shy away from spot treatments because I find they leave my skin dry, flaking, and peeling. Using Murad Acne Spot Treatment, I wasn't even the least bit dry, even after multiple applications. Another sticking point: makeup didn't go on over the spot treatment smoothly. It kind of collected on and around it if I wasn't careful. Applying it at night, or leaving your face bare, is probably a good idea while you're using this. As far as spot treatments go, I'm a big fan of this one. But just remember that spot treatments aren't meant to be used in place of an acne treatment, and they won't clear up acne. Spot treatments are used on active pimples, while acne medications stop breakouts before they start. Still, spot treatments are good for those who have only occasional pimples, or as a supplement to your regular acne treatment medication. Does Zeno Acne Clearing Device Really Work?